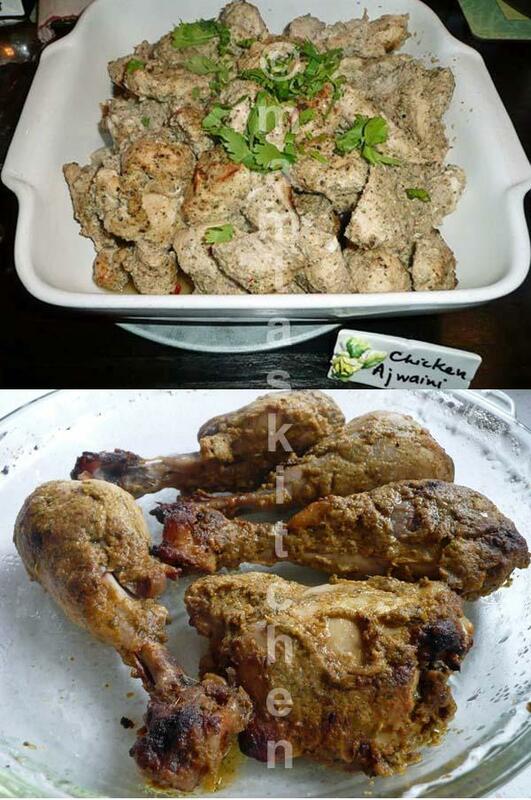 Tandoori chicken is one of the most popular non-vegetarian dishes on an Indian menu. The name ‘tandoori’ simply means cooked in a ‘tandoor’ or a very hot oven, often made of clay. It does not dictate the exact spices used or the colour of the finished product. The dish cooks just as well in any type of hot oven. This particular dish has a unique flavour of ‘ajwain’ or carom. Also see BBQ Selection and Marinade Selection. 1 kg. small chicken breasts cut into bite sized pieces. You can use chicken drumsticks or other parts too. Stab each skinned chicken piece in a few places, using a fork. This helps to infuse the marinade. Measure all other ingredients, except carom seeds, directly into a blender and blend. Take out in a bowl, add and mix carom seeds (ajwain). Mix thoroughly with the chicken pieces and leave to marinade for a few hours/overnight, in the fridge, in an airtight container (otherwise everything in the fridge will smell of garlic). Heat oven to maximum, remember tandoor is hot! Mine heats to 300C. Line a baking tray with aluminium foil (this saves washing up). Spread out chicken pieces on the tray and bake in the centre of a hot oven, until top and edges are nicely browned. It should look crispy and charred in places, as if you have cooked it on a BBQ. If using drumsticks (legs), meat will begin to come off the bones a little when ready. You will need to turn the pieces over half way through cooking. If too much liquid accumulates in the tray, drain it off (it can be served with the chicken in a gravy pot). The chicken pieces should be dry…ish, not soggy. Time varies in different ovens but it usually takes around 20-30 minutes in a preheated oven. Serve hot, garnished with lemon wedges and sliced red onions. It can be served with curries, dals and Nan or simply with a salad, as a starter or as a light meal. Yoghurt Mint Sauce also goes well with it. Marinated chicken can just as easily be cooked on a BBQ. Always cook chicken thoroughly. I sometimes half or 2/3rd cook it in an oven, before cooking on BBQ. Half cooked chicken can cause food poisoning.